You're playing in a multiple deck game and the rules are more or less standard. You are dealt a nine and a seven for a two card total of 16, while the dealer shows a ten as his upcard. Will you stand on this hand, considering that in all likelihood you're going to bust if you hit it, or will you hit, figuring you'll have no chance at all if you don't? Well, the correct play to make is to hit this hand. 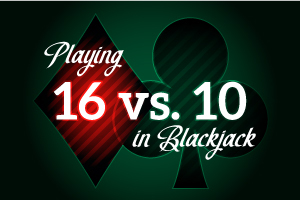 Needless to say, you are in one of the tougher spots a blackjack player can be in. Having a 16 puts you into a "no man's land" of sorts because whatever you do, it can seem like the losing move. You have, in point of fact, a very slim chance to win the hand. Now what you have to do is start thinking about how you're going to LOSE LESS on the hand. And indeed, this is a VERY close call. Taking the posture where you're going to always stand on this hand will bring you a defeat 77% of the time, which constitutes the number of times the dealer is going to be pat (in a "standing" position) with a ten showing. Hitting the hand will obviously have you busting out quite a bit, and you will win 2.7% less. But you will also lose 3.1% less, making it a slightly better decision to hit the 16 here. Don't forget a very strong rule of thumb: when you're in a losing situation, at least position yourself to minimize your losses when you can.